Also known as dry camping, boondocking is camping in an RV without any utility services. It may seem simple enough to top off the tanks and head out, but there are several things you should know prior to heading out into the middle of nowhere which I will cover here. This is a long post, with more tips and explanations, so stick with me while we cover these boondocking tips. The key to enjoying anytime traveling is removing as much stress as possible. Spending some time in your RV and getting to know your true comfort level will make planning extending trips away from civilization much easier. Be sure to review your owner’s manual, and know your RV’s tank capacity and weight limits. Being away from utilities for an extended period of time requires additional resources that can push your RV to the edge of its capacity. Depending on the location and time of year you may need to pack in extra water in addition to a full fresh water tank. Extra gear like solar panels and extra batteries add weight that needs to be factored into your max vehicle weight or towing capacity. One of the best things about boondocking is being far away from the crowd. That means you are also far away from help. 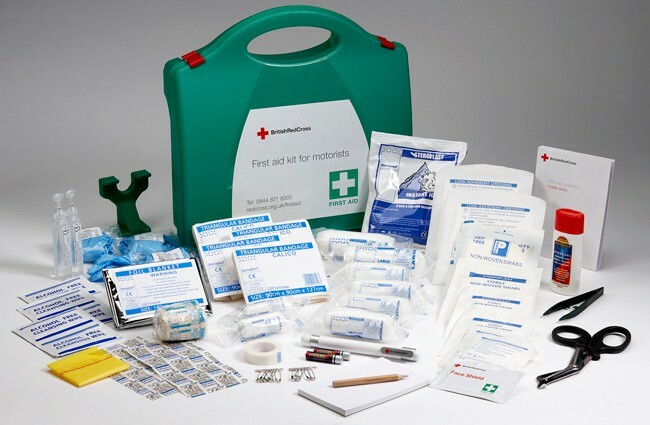 Pack a good first aid kit, and be sure to replace anything that you use after your trips. Have plenty of gauze and bandages to address an injury long enough for you to get to help. Ensure you pack enough of your medication to last your trip, and don’t forget an Epipen if you have allergies. Consider taking a first aid course with those you travel with. Knowing how to self-perform the Heimlich Maneuver can literally be a lifesaver for solo travelers. Everyone is going to breakdown at some point, but when it happens several miles from the nearest paved road the situation becomes more complicated. 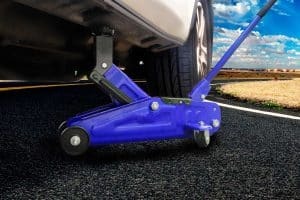 You should always be traveling with a standard tool kit and roadside tools. Adding an ax and shovel can help get you out of a tight spot. Voltmeters can also be helpful for diagnosing any electrical issues. Some wire nuts to fix a split wire, a roll of duct tape, and a can of fix-a-flat could come in handy. The majority of the places we visit are very safe. Most people we meet are also very nice until they are not. Consider taking a self-defense course or martial arts training. These are also great options for a good workout. If you would feel safer with a firearm, be sure you know how to use and store it properly. You should also check the different state laws for the areas you plan to visit. When all else fails a can of pepper spray, or bear spray, can also be a good option. Being prepared for a bad situation can help give you peace of mind and increase your overall comfort factor while off the beaten path. I know you are wondering why trash would be listed under preparation. Keep in mind that you are going to be stuck with anything you don’t consume while out camping. Boxes, wrappers, and other throw away items are going to pile up the longer you stay out. Take some time to take things like cereal out of the box. 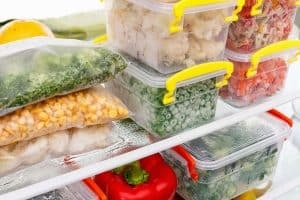 Reusable containers are great as they don’t lead to any trash at all. Boondocking means you cannot hook up your RV to shore power. 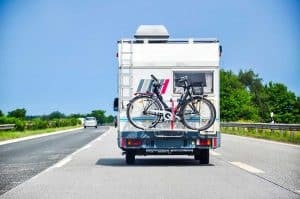 For many RV’ers, that’s the main challenge – how to comfortably in an RV without a limitless steady source of electricity. While preparing for boondocking, take the time to research all of these options. Just how much electricity you need will determine the best solutions for your boondocking adventure. Once you’ve set up your generator, extra batteries or other means of boondocking power, take the weekend to “test boondock” at home. Unhook your RV from shore power and water and see how everything works out. How much electricity did you use? What kind of power is needed to operate your must-have appliances? It will be easier to adjust your solutions while still at home, not far away from the camping store. Now that you have your rig all set up, it’s time to go out and find some great boondocking camping areas. There are tons of resources to help you pick locations to visit. The easiest way to research dry camping locations will be online. There are several websites, blogs, and forums that cater to boondockers. Doing a Google search for “free RV camping” and “BLM land” near the area you are wanting to stay will help you find good areas. There are also some mobile apps that locate public land that could prove useful. Once you find an area you like, stop by some local camping stores and start a conversation with the owners. Ask them if they know of any nice areas you can hang out in for a while for free. Even if they don’t know of any potential campsites, they can still point you to the must-see sights in the area. Forest Rangers and State Park staff are great resources to help find boondocking locations. They can also supply maps and let you know of any rules that you need to follow. 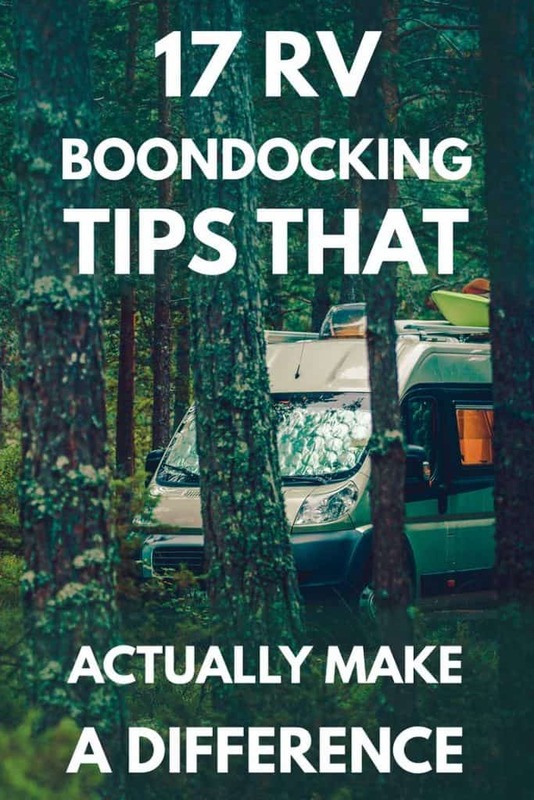 Settling in while you get there is something you’ll have to do, so follow these tips to get the best start for your boondocking experience. This is always preferable, even when you’re in a campground, but all the more so when boondocking. 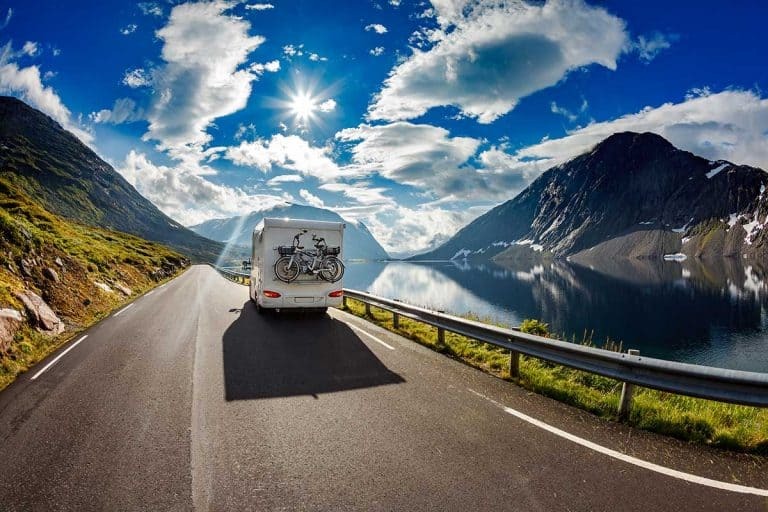 You won’t have a marked parking space, so you’ll need to visually inspect the area to find the best spot for your RV. 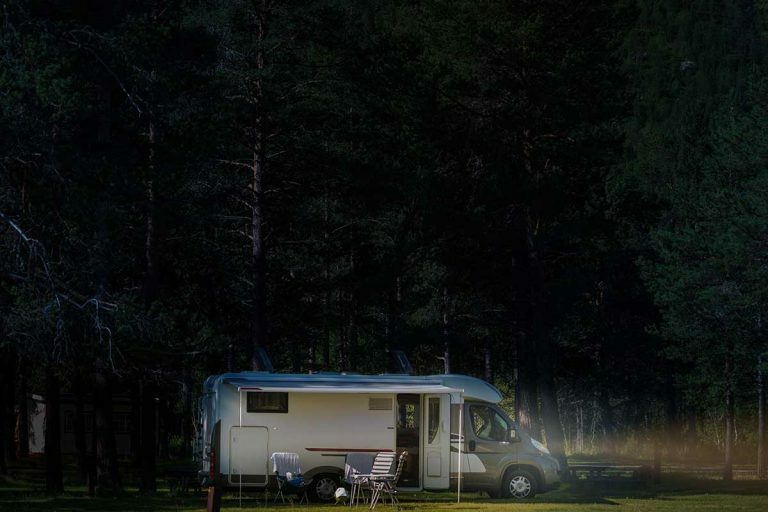 In fact, depending on how far out into the middle of nowhere you plan to go, you should consider investigating your potential campsite without the RV. 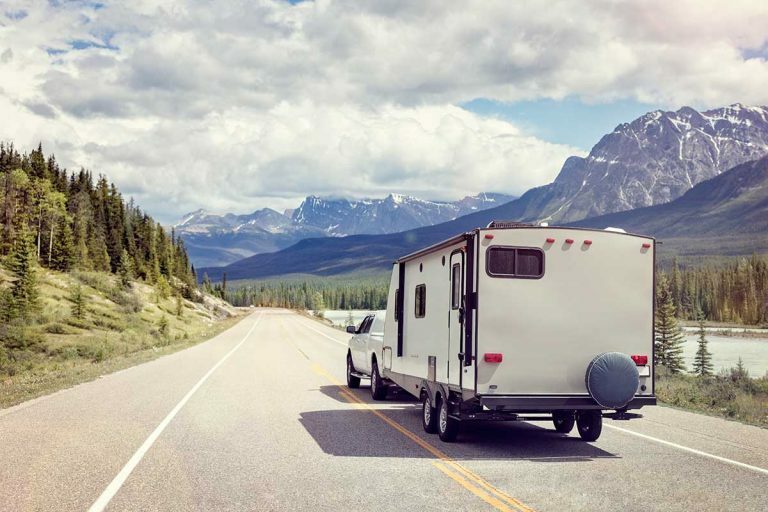 Take the time to disconnect the travel trailer or toad, and take a drive down any sketchy roads along the way. 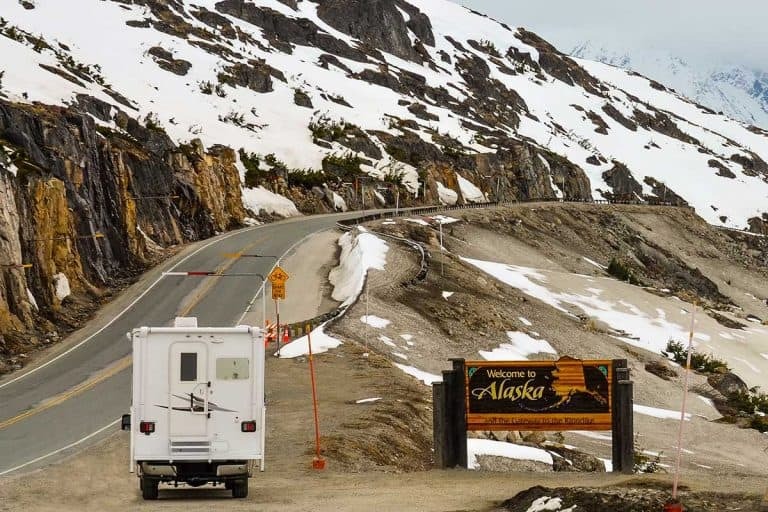 You don’t want to be several miles into a narrow dirt road only to find that you can’t make it all the way in the motorhome and have to back out the whole way. Checking out a remote location prior to setting up camp can also help you see what additional items you may need to be comfortable there. Things such as some wood to supplement your leveling blocks would be nice to have so you don’t have to go back into town right away. Now that you are finally set up and enjoying everything boondocking has to offer, the last thing you want is to run out of the water. There are lots of ways to extend your water supply, and the most important is just not to waste a single drop of running water. Most RV shower heads have an on/off switch that can be used to stop the flow of water while you lather up. These are handy to save water when you would be standing outside of the flow of the water anyway. You can also plan to use solar, or camping style showers. If no one is around for miles, why not take a shower outside. If you really want to take this to the extreme, you could always just use baby wipes to rinse off after a long hike. Read our post about the length of a shower in an RV, as it has more boondocking tips for making the most of your showers while off the grid. You would be surprised at how much water you use when washing dishes. Saving water while cleaning up after meals can be difficult, but you can also catch the dirty water and use it to flush the toilet. Consider using disposable plates and utensils. I know we spoke earlier about reducing your potential trash, but you may need to weigh the benefit of extending your water supply. Plan to camp near a natural water source. Getting fresh water from a nearby lake or stream is a great option for refilling your water as you need it. Be sure to bring along any water filtration and purification equipment you may need. Alternatively, know where the nearest store is where you can fill up on clean drinking water. You can also pack in extra water in jugs. Once those have been used up, you can always hop in the truck or toad and head into town for a refill. Finally, a couple of tips on how to conduct yourself while boondocking, so as not to cause any trouble – or get into any. Isolation is one of the benefits of boondocking. There may come a time you have to share a location with another camper. Keep in mind they are there for the same reason you are, and be respectful of their experience as well. 15. 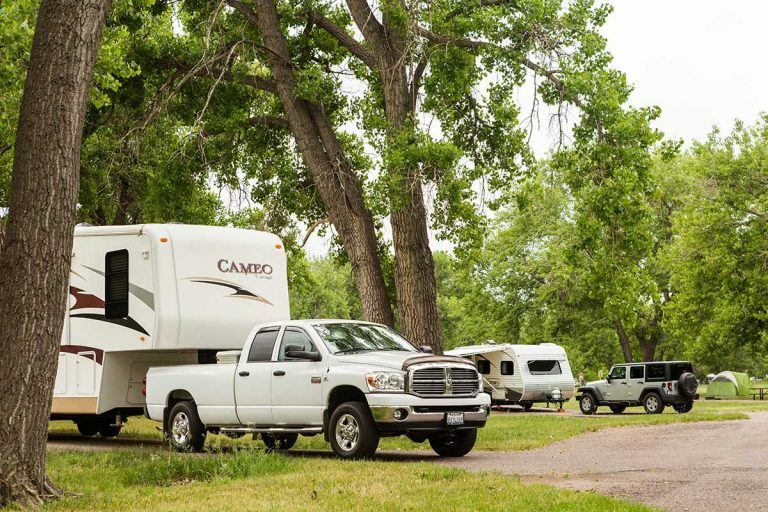 Leave plenty of space between your campsite and any neighbors. 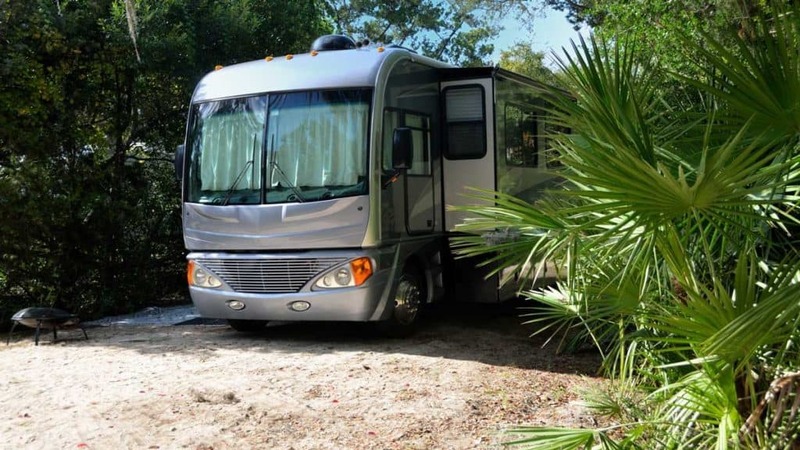 Place your RV behind some sort of natural barriers such as large rocks or trees if possible to help maintain a natural landscape for both of you. You didn’t come all this way just to look at other RV’s just around the corner. 16. Only run your generator when needed, and keep music to a low volume. Unless you’re 100% sure no one is around to hear you, keep the volume down. 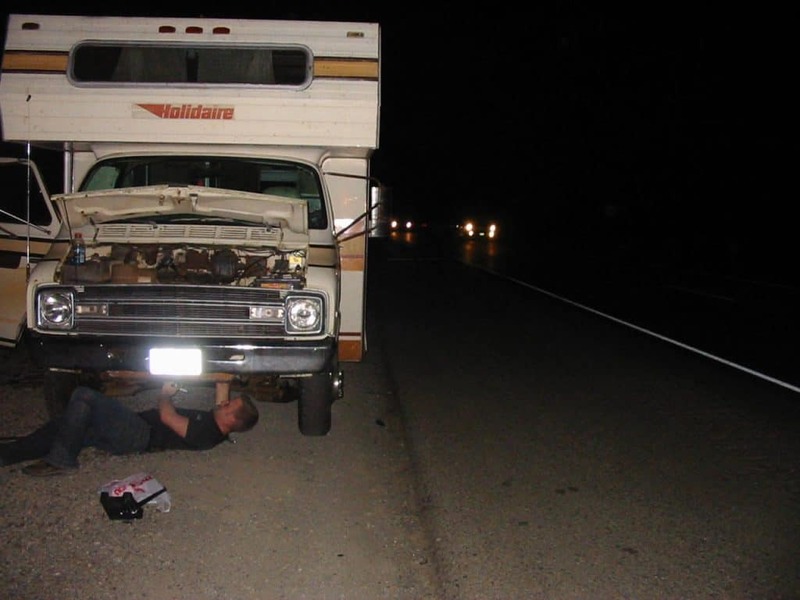 Some boondocking spots can, in fact, have multiple users, and whenever that’s the case, it’s best to limit the use of your generator, especially if it’s a loud diesel unit. After all, you’d want your neighbors to do the same. Pack out what you pack in. Do your best to leave your remote campsite in better condition than you found it. Do a good police call of the area once you have everything packed up and ready to head out. No one wants to arrive in the wilderness only to find someone else’s trash laying around. Consider this a bonus tip! Even dry camping sites may have rules. Check with the park rangers and landowners to see if they have any special requirements for the area you plan to stay in. Rules around how long you can stay, and what activities are allowed in the camping area should be followed to avoid any unnecessary drama. Ever wake up in the morning after a nice evening around the campfire, make a cup of coffee, and open the window shades just to see the side of your neighbors RV? You start to think about all the pictures of all the other RV’ers on Instagram out in the middle of nowhere and realize this nicely laid out parking lot wasn’t the adventure you were looking for. 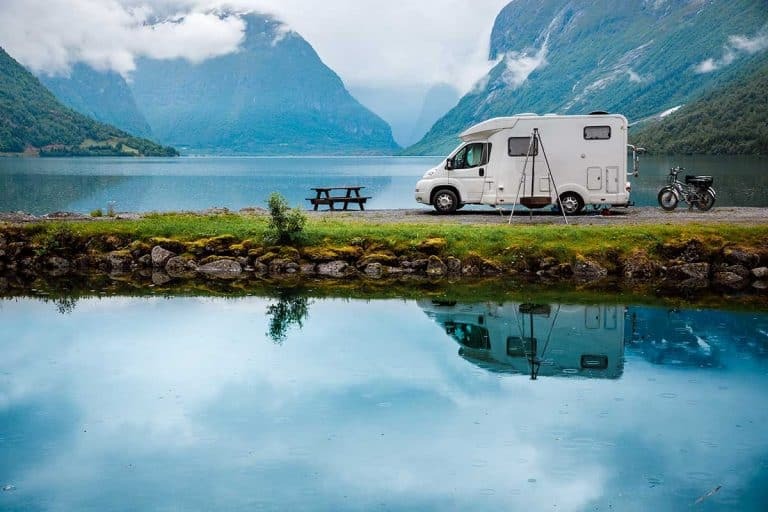 Rest assured that you can also experience the outdoors and all those Insta Worthy destinations in your very own RV as long as you know what is truly needed to enjoy boondocking. With enough preparation, research, and the right mindset you too can set yourself up for extended stays away from those crowded campgrounds. We covered quite a bit of information here, and I’m hoping you found some of this helpful as you plan your next off-grid adventure! What are some tips and tricks you find useful when you go boondocking? Please feel free to add them in the comments below.